There are now 84 Women and Children Protection Units (WCPUs) in 48 provinces and 9 cities of the Philippines. 55,728 abused and high-risk children and their families have received care and services from the WCPUs nationwide. Every day Child Protection physicians and social workers see to it that abused children who seek their care are safe, healthy and developing to the best of their potential. Finding pockets of hardworking, dedicated local government partners, combining strengths with like-minded NGO’s, WCPU’s are examples of the Philippines at its best. We are inspired by the vision and generosity of David Bradley who started and continue to work with us. With the leadership of a new board of trustees, we are poised to fulfill the vision of having a Women and Child Protection Unit in every province. Excellence: We strive for the highest standards, guided by evidence in research, experience in the frontlines and evaluation of programs. Integrity and accountability: We are guided in all actions by the highest standards of conduct and the code of ethics of our professions. Collaboration: We actively seek out partnerships with government and non-government organizations as well as individuals who share our mission. Leadership: We provide leadership to advance the field of child protection in both the science and the service. We have the “right people on the bus” and the level of leadership to scale up our efforts. The global recession makes it even more urgent that effective programs should be supported. The nation cannot afford not to prevent the abuse of its children. 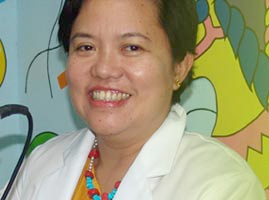 Recipient of national awards and recognition such as Outstanding Women in Manila (Soroptimist International, 2009), Most Distinguished Alumni for Health (UP Alumni Association, 2008), Top 10 Leaders in Health (2005), Most Outstanding Philippine Doctor (Philippine Junior Chamber of Commerce with DOH and WHO, 2004), The Outstanding Women in the Nation’s Service: Awardee for Medicine, Child Protection (2001), Most Outstanding Research in Health in Nutrition (Deptment of Science and Technology). 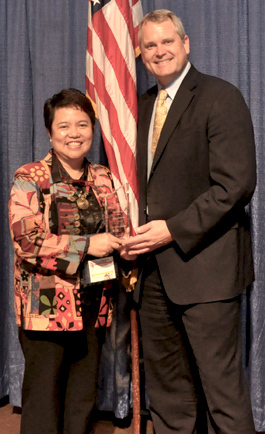 GAWAD Pagasa Award, a group award, was conferred by the Commission on Civil Service Commission to PGH-CPU for dedicated performance exemplifying the best in any profession or occupation.